"I could not have asked for a better trip"
“I had an amazing experience. Everything went according to plan and it was perfect. The accommodations were sublime, and the staff and hospitality the best I have ever had. Travelled to Kenya in September 2018 on a Migration Safari. 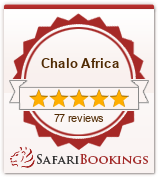 View this review on SafariBookings.com - an independent safari review site. —Karan Lahiri, India. Travelled to Botswana in June, 2018. —J. Delsi, United States, United States. Travelled to Kenya in September 2018. Once in a life time unforgettable Experience! —Bhupendra and Krutika, United States. Travelled to Tanzania in August 2018.